FedEx Ship Manager is the shipping software that can be used to automate and make your shipping more straightforward. It ultimately helps high-volume e-commerce companies to access forms, prepare and arrange shipping labels and documents using databases of addresses and commodities, monitor the status of the shipments and derive customizable reports. Subsequently, if you run an e-commerce business and handle a high volume of shipments, this software will significantly save time. 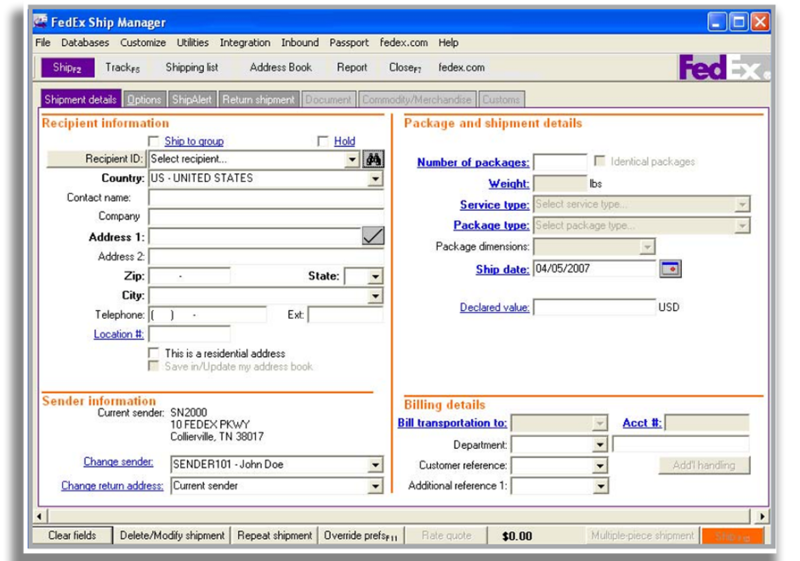 FedEx Ship Manager can be downloaded to your computer. Thus, this enable you to hasten and automate the process of shipping your products. It helps in preparing shipping documents efficiently and fast. Users can create labels for multiple-piece shipments, up to 25 pieces, at one time and track with only one tracking number. All of your shipping activity can be seen on screen, in stories, or extracted and saved to a file, without having to bring out your air waybills. Your shipping activity is also available in our Reports and Analytics. FedEx shipping manager offers a complete list of all products in your database. FedEx shipping manager gives a list of evidence of deliveries for all packages. It also provides an up to date list of the shipments that have been clear. The software keeps recipients and commodities databases, offering you the option to alter information, generate shipping documents, etc. easily. FedEx Shipping Manager distinguishes itself by enabling you to control your shipping activity. Quickly find, see, change, copy, quick print, and erase shipments from your records. Even when your connection to the internet is not stable when you are online don’t fear. Features enable you to communicate with the FedEx systems, download your shipping details and other information to your computer. FedEx shipping manager allows you to use its FedEx Ship Manager Software online assistance to seek advice on specific tasks. How do I start using FedEx Shipping Manager? Anyone in possession of a FedEx Account Number can get the ship manager software from fedex.com and download. You can access ship manager at fedex.com 24 hours a day, 7 days a week. Generally, with FedEx Ship Manager, you get a powerful tool that runs effectively on a local client and only needs an internet connection and a computer. In addition, it also provides dynamism and allows large volume e-commerce companies to automate shipping. In summary, if you have any questions about shipping software or would like information about our great partners, reach out to us at Refund Retriever. We can help with your FedEx shipping logistics.